Redbox parent, Coinstar, built its core business offering frugal customers a convenient way to liquidate their spare change. Similar focus on frugality and convenience has helped turn the company into a movie rental powerhouse. 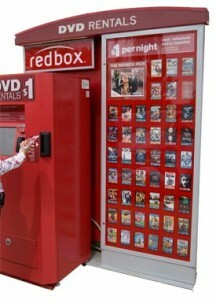 While Blockbuster and other brick and mortar rental shops are struggling, Redbox’ kiosk approach is booming. The company is adding tens of new machines a day and expects its yearend inventory to top 30,000. Studios have taken notice and gone from critics to partners. A month ago, Redbox signed deals with Universal and 20th Century to bring the studios’ movies to Redbox kiosks 28 days after their street debut. In the next month, the company expects to start adding Blu-ray at a price of likely $1.50 a night, slightly higher than the $1 per night charged for standard definition. Redbox is also planning to test sell through of catalog titles for$5, $7, and $9. With low overhead thanks to retail partnerships it’s tough for traditional rental stores to compete. “We can do it 12 square feet what Blockbuster [does] in about 2000” CEO Paul Davis noted at the company’s annual meeting. The typical Redbox kiosk holds hundreds of DVDs and sit conveniently in retail stores ranging from McDonald’s (which originally incubated Redbox) to Walmart to 7/11. The stores get a share of revenue in exchange for use of their floor space. Redbox is tracking to record well over 40m Rentals per month. A digital strategy is reportedly in the works for the day when disc rentals fade. In the nearer term, with Blu-ray likely to add some additional revenue, the company is clearly satisfying consumer demand for convenient, low cost entertainment solutions.